Scottish ship captain John Macpherson (1726-1792) and his first wife, Margaret, built their grand country estate on this site, high atop cliffs overlooking the Schuylkill River,between 1762 and 1765. They employed as their builder-architect Thomas Nevell (1721-1797), an apprentice of Edmund Woolley, the builder of Independence Hall. Both Macpherson and Nevell intended to make a bold statement with this house. Macpherson could announce his ambition to join established Philadelphia society, whose greatest city houses Mount Pleasant certainly rivaled. Nevell hoped to demonstrate his considerable craft and architectural knowledge. Together, they built one of the grandest homes along the Schuylkill, one that John Adams, on a visit to the residence in 1775, declared "the most elegant seat in Pennsylvania." 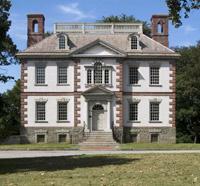 Today, Mount Pleasant is considered one of the greatest American houses of its type, still standing on its original site in what is now Fairmount Park. The breath-taking beauty of the house's interiors and vistas, the elegance of the lifestyle of colonial elites, and the curiosities of Captain Macpherson's life are all on display at Mount Pleasant. The rooms in this colonial masterpiece feature the craftsmanship of some of the leading Philadelphia artisans, such as carver Martin Jugiez.